What gases began to accumulate after Earth’s crust finally solidified? As Earth’s crust solidified, gases began pouring out of fissures and volcanoes, accumulating in the forming atmosphere. These same gases still emanate from modern volcanoes, and include carbon dioxide (CO2), water vapor (H2O), carbon monoxide (CO), nitrogen (N2), and hydrogen chloride (HCl). As these gases interacted in the atmosphere, they combined to form hydrogen cyanide (HCN), methane (CH4), ammonia (NH4), and many other compounds. This atmosphere would be lethal to most present day life-forms. Fortunately for life on Earth, over the next two to three billion years the atmosphere continued to change until it reached close to its present composition. 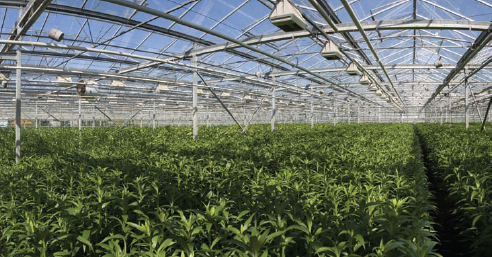 Lilies are grown in a greenhouse in Almere, the Netherlands. Just as this structure allows tropical plants to grow in a cold climate, the natural greenhouse effect created by Earth’s atmosphere warms our planet (iStock).